This came in late last week but I've been incredibly busy and blog neglect has set in. This is a very unique offering from the Goose Island guys. Brewed to mark the completion of 1000 batches of beer. 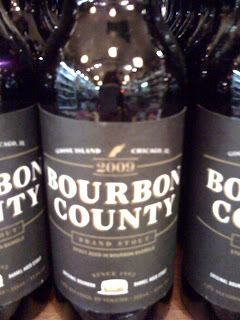 Aged for 150 days in Bourbon Barrel. This imperial stout is described as 'The Cigar Beer'. I'm not a Montecristo smoker but I'll definitely give it a go with a Marlboro Light. Ooh I have a bottle I picked up at the store (while collecting my tickets) before Christmas without paying any attention to it. I must try it and see if I regret not getting some more. So???? What did you think?..... I love it!!!!! Patience is needed here. I will try it tonight and report over the weekend.